Muffler - Silencer Seamer. 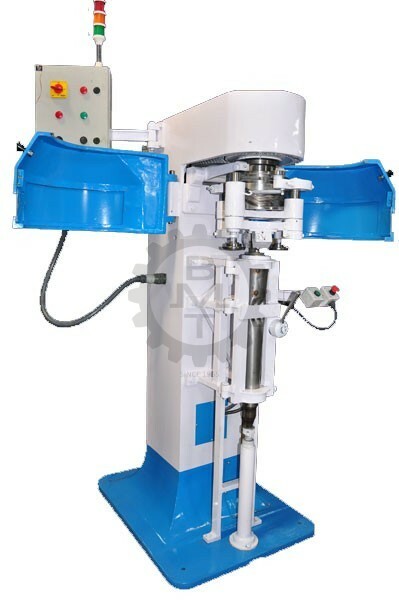 End Cap Hemming and Seaming machine. For Clinching / Hemming / Seaming Tail plates & End Caps of automotive silencers & mufflers. Operation by Foot Switch or Dual Push Button. Positive clamping system to ensure rigidity of muffler during seam operation. The silencer / muffler is placed on the support and is held vertically by means of a non-contact magnet. The dual push buttons are pressed to begin the operation. The silencer is pneumatically clamped and the seam operation is started automatically. After completion, the seaming head is stopped and the muffler is de-clamped for unloading. The sequence is controlled by a simple PLC (Programmable Logic Controller). This Seamer is used for inward seaming applications. For standard double seaming of mufflers, please see our Round Can Seamer page. 1320 x 950 x Ht (as per muffler height). *Can be modified to suit customers requirements and applications.